This entry was posted in What Pegman Saw and tagged Oregon, Portland, Railings, Ripple Effect, Suicide, Vista Bridge. Bookmark the permalink. Thank you, John. It wasn’t easy to get it down. I almost hated to click ‘like’ on this one. I do like the way you twined all of these lives together. Well done. I know what you mean. I was trying to show how one act affects so many. In this case 150 didn’t feel like it was enough! Such a sad tale but well told of intertwined peoples lives. It’s sad that souls believe the world is better off without them and elect to exit that way. It leaves so many lives hurt. Thank you, Jan. It is so very sad and exactly that -their lives are over and the ripples go out far. I just can’t believe what you came up with here. The sentient vibe runs through this piece. That feeling of complete and utter hopelessness, when you think there is no place else to turn. Holy Moses, it’s a thing and then some. I’m really proud of you for coming up with this one. Because it’s not just a great piece of writing, it’s also a real and honest point of view from the worst kind of vantage point. To which most people never get a second chance. Neither can I! I was so afraid that it would come across choppy. I was trying to show the ripple effect of how one person’s act affects so many that they don’t even know and for a long time after. 150 words can, at times, be a real pain. So thank you. I’m glad you feel it comes across. I was hoping for decent and you give me great? Humbled, am I. Not choppy. Not at all. It was powerful and poignant. Because you’re right. One ripple begets others, and before you know it, you have a wave on your hands. Which is what’s going on right now. Don’t be humbled. Be proud. Kewl. Sometimes we can’t judge our own stuff properly. One ripple goes far. We can’t even imagine to what extent. It is hard to critique your own work sometimes. Ripples mean something. Phones do work. It is. Honestly, anyway. Rarely will I look at what I’ve done and say Yep – ya done good! At best I’ll admit to something being ayt. You do. And yet, you are so damn good. Aw shucks! Thank you Ethel and Cheryl – through Ted! Much appreciate the song and the mention! I am frankly shocked that there are many lobbying to have them removed. Honestly. They have 100% stopped the jumpers since 2013. Does that not count for something? And thank you, Crispina. Glad you liked. I was afraid it might be too disjointed. Odd. My Reader says this last comment didn’t send. Yet lo, here you have it. Ho-hum. WP is stupid like that. Sometimes it tells you it didn’t send but did. Other times it indicates nothing and sends nothing. Nice little story! I love it! In the UK we would probably be arguing about the human rights of an individual to jump if they so wished!! Great story, well linked with consequences. Thank you, Peter. I’m so glad it worked. We are excellent at nuts now! A sad story but I like the way you’ve shown the impact on all the characters and I’m glad that something has been done to help stop it. Thank you Andrea. Would you believe two of the characters each witnessed five and seven suicides? How awful. Wow, Dale. I think this might be one of your best. Very powerful. Oh wow, Merril. Thank you so much. Guess I was worried for nothing. I know what you mean about the “Like” button sometimes. I like the way you tell this tragic story from different points of view. Well done. You really put a lot into creating your stories using the prompts. Way to go, Dale! Thank you. I do try! I really like being restricted by the number of words. It forces me to think! They fenced the Golden Gate, Too, but it only served to slow them down. I can think of much gentler ways to off myself… Excellent take , Dale. And they included phones all along it so people can call for help. At least the Portland one has been 100% effective (last time I checked). Yes, I have to agree with you, there are much gentler ways! Yikes, such a tragic history for such a beautiful spot. Wonderful job getting across the interconnectedness of all of them. Sorry I missed your birthday, but hope you had a great one. HAPPY (Belated) BIRTHDAY & thanks for the congratulations on passing the exam! We’re all meeting in Dream-Portland to celebrate your birthday tonight. See you there! Thank you, Karen. I’m glad the ripple effect came through. And I thank you! I’ll be there! But sans earthquake, ok? Well done, Dale. A great piece on a sensitive subject. Suicide affects many. Your story drove that point home. I half expected to see a link or number for suicide prevention below it. Great story! That’s what I wanted to convey so I’m very glad it came across. 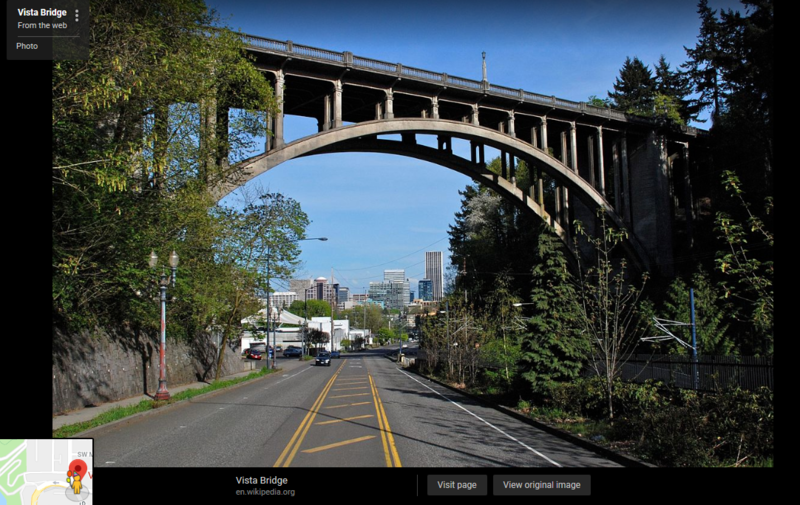 During the year I lived in Portland I had no idea this was a suicide bridge! Thanks for a great story to bring it to our attention. One of those things we discover thanks to Pegman! Glad you liked my efforts. Ok, that caught me by surprise. Well done, Dale. It’s a topic not spoken about enough, at least down here. Gold star for you! Good write! We have a bridge like that here. The city put up a very, very high mesh fence. YES, it works. At least it keeps people from jumping. Do they find another way? Why is a semi-mystery to me. Honestly. It has been proven that a deterrent like a fence is enough to break the impulse ..